Also known as The Station in Guard, is a series of Cesar Chavez Foundation in which vignettes of 30 seconds in Spanish are produced and aired throughout programming. The vignettes include a a variety of experts like psychologists, lawyers and activists. 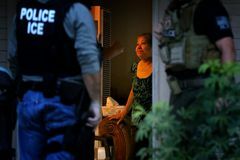 These professionals advise the immigrant community on how to be prepared in case of a raid, a deportation or what to do in case a driver is stopped and asked to be identified. The main purpose of the product is to create awareness, educate and inform the Latino Community during times of harsh enforcement and the zero tolerance immigration laws under this administration. Psicologa Diana Milner nos habla de los indicadores del suicidio/ Psychologist Milner explains red light of suicide and ways to prevent it. La importancia de la representacion legal / Activist Schwartz talks about the importance of legal representation. Activista social Schwartz da consejo sobre como actuar ante una autoridad / Activist Schwartz advises on how to keep calm in front of an agent.